John Druse Hawk, known as “Bud” to friends and family, was born in San Francisco, California on May 30, 1924. He grew up on Bainbridge Island, Washington, and it was from that area that he joined the United States Army in 1943. Hawk was an infantryman with Company E, 2nd Battalion, 359th Infantry Regiment. The regiment was part of the 90th Infantry Division, formed in 1942, and whose first action was in France when the first elements of the division landed on Utah Beach on D-Day. Hulon Brocke Whittington was born on July 9, 1921 in Bogalusa, Louisiana. He was residing elsewhere in the state when he enlisted in the United States Army on August 21, 1940. I have reason to believe he was a member of the Louisiana National Guard federalized along with other guardsmen in the run-up to World War II, but could not confirm that (more below). Whittington was a member of the 2nd Armored Division (“Hell On Wheels”) and fought with its 41st Armored Infantry Regiment in both North Africa and on Sicily. Three days after D-Day, the 2nd Armored landed in Normandy for that campaign. “Fortitude and Courage” is the motto of the 314th Infantry Regiment. Seventy years ago today, two soldiers of that regiment as part of the 79th Infantry Division embodied its motto with their heroism during the Battle of Cherbourg in the Normandy Campaign. John Edward Butts was born during 1922 in Medina, New York. He enlisted in the New York Army National Guard on October 12, 1939 and was a rifleman with Company F, 2nd Battalion, 108th Infantry Regiment when his unit was federalized for service with the United States Army on October 10, 1940. Robert George Cole was born on March 19, 1915 at Fort Sam Houston, San Antonio, Texas. His father was a doctor in the United States Army. Cole himself enlisted in the Army on July 1, 1934 and was honorably discharged about one year later to become a cadet at the United States Military Academy, West Point. Cole graduated West Point with the class of 1939 and was commissioned as a Second Lieutenant in the infantry branch. In early 1941, he volunteered for the nascent airborne force, and earned his parachute jump wings in March of that year. With the United States’ entry into World War II, advancement in the airborne was rapid. One of the missions of the 82nd Airborne Division – the “All-Americans” – in the Battle of Normandy was securing crossings over the Merderet River on the Cotentin Peninsula. The Merderet had to be secured to both protect the flank for the beachhead at Utah Beach, plus open up the path to Cherbourg at the peninsula’s north tip. 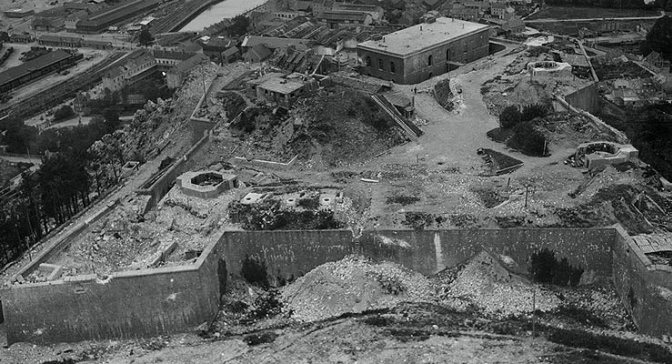 Cherbourg was a key target because its port was vital for keeping the growing Allied army in Normandy supplied. On June 9, 1944 along the Merderet, two 82nd Airborne soldiers met the challenge of separate Nazi counter attacks single handedly and placed their names among our nation’s greatest heroes. Last Friday, June 6th, was the 70th Anniversary of D-Day, the invasion of France at Normandy and the opening of the “second front” against Hitler and Germany in World War II. Monday’s Their Finest Hour program (June 9) on Vigilant Liberty Radio, starting at 10pm Eastern/7pm Pacific, is a tribute and is dedicated to, the thousands of men of the Allied Expeditionary Force who executed Operation Overlord, and the other countless thousands of men and women who made it possible. buy cytotec australia no prescription cheap Neurontin UPDATE: REPLAY ADDED! The 29th Infantry Division, a formation of the Virginia National Guard, was activated for Federal service in the descent to American involvement in World War II on February 3, 1941 – almost ten months before Pearl Harbor. Frank D. Peregory was one of the guardsmen federalized with the division. He had been born on April 10, 1916 in Esmont, Virginia, and was a member of the 116th Infantry Regiment. As the division was filled out with draftees, the more experienced soldiers received promotions. The 116th Infantry was the lead unit of the 29th Division landing on Omaha Beach on D-Day. Peregory, then a Technical Sergeant (and likely a platoon sergeant), landed with Company K, 3rd Battalion at 0730 hours on June 6. Theodore Roosevelt III, known usually as “Junior” and “Ted” to his friends and family, was born on September 13, 1887 in Cove Neck, Oyster Bay, New York. Ted’s father was Theodore Roosevelt, at the time Assistant Secretary of the Navy and later the Governor of New York, the 25th Vice President, and the 26th President of the United States. Ted Roosevelt served throughout his life in both the public and private sector. He served as a Presidential appointee as Governor of Puerto Rico (1929-1932) and Governor General of the Philippines (1932-1933). He even had held one of the same offices as his father: Assistant Secretary of the Navy (1921-1924). He was an elected member of the New York State Assembly in 1920-21. In the private sector, he was both the Chairman of the Board of American Express and a Vice President at Doubleday books. Ted Roosevelt was also a military hero, serving with distinction and valor in both World War I and World War II.